I have had a post sitting in my draft file for about a month now. I post on several places and for some reason, I forgot to come back to Blogger! I am a bit embarrassed about that! 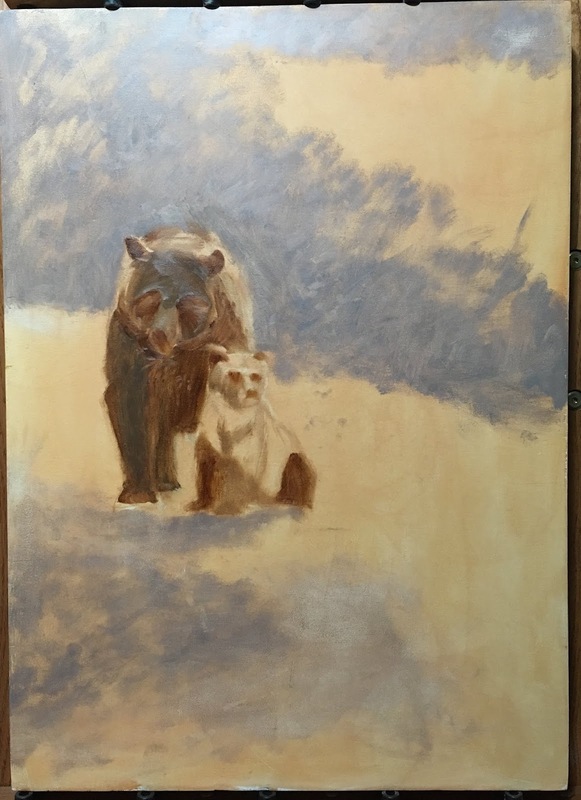 The photo above is of Day 18 in the Strada Easel Challenge that I participated in last month. Yes! I did successfully complete all 31 days of the challenge! You will be seeing more of the artwork in a couple of weeks as I am getting them ready to sell off to raise funds for a quality printer. I plan to make and sell prints of my drawings. I also want to mention that any work I sell, no matter what medium, will have 10% of the net proceeds going to an environmental or animal cause. 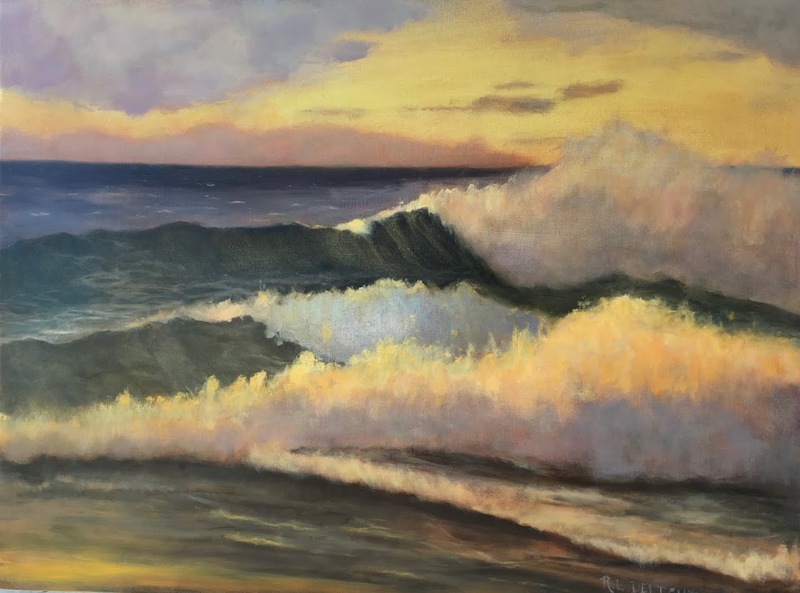 The wave paintings will have the 10% donated to the Cape Falcon Marine Reserve. Cape Falcon is just a couple of miles up the road from us. I am currently in the middle of building a brand new art website that will feature a blog front and center and will host video, some how-to content, my continuing art journey, and art for sale. Anything else that comes up on this journey I am on will be there. It will have a focus on art and creativity I will be posting a link to that website soon! This blog will continue but it will change and grow a bit more. There will be art posts here too but I am also going to add more about living a creative life. I will not only be sharing posts about art and creativity but also about veganic gardening, (I named my garden Red Twill Gardens! 💜), our house renovation, playing music in a band, and my gradual and sporatic return to fiber art, another of my loves. I hope to create a dialogue and inspire others in the creative journey. I don’t know what that looks like yet but I plan to see. Finally, a huge thank you to any who still read this after such a long silence. Like so many creative people, I lead a busy life. I am looking forward to catching up on reading the blogs of all my old friends and a few new ones as well! Today we were in between storms. There was a high surf warning going on when I got to the beach and there was no place safe to draw. I stayed in my car again. I suspect that many of the drawings for this month's challenge will be done from my car! Fortunately, I wasn't far from the high tide line by the side of the road. So far I have been going to my local beach to draw the waves, about a mile from my house as the crow flies. I will be traveling up and down the coast a few miles to draw at the other beaches. They are all a bit different and they change every day and hour. 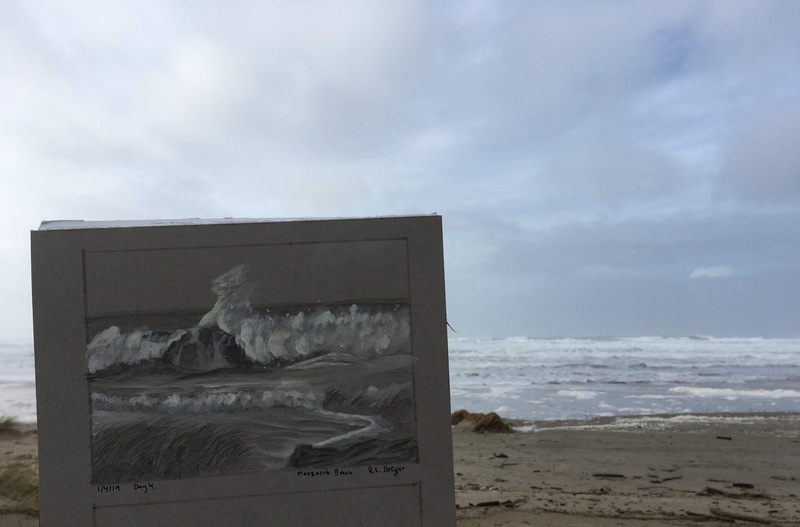 The waves and beach looked quite different when I took the second photo than when I started the drawing. 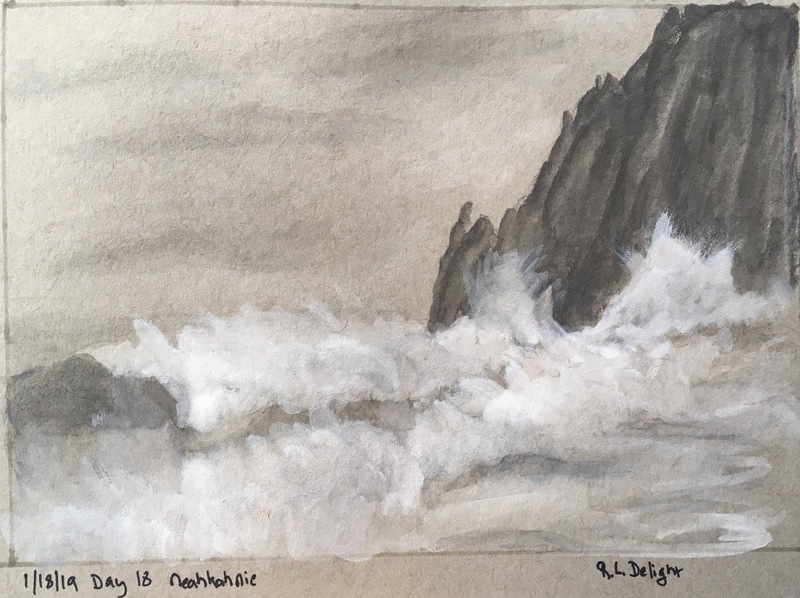 I really do love drawing and painting waves! I have yet to get them on paper and canvas to my satisfaction. There are a lot of subtle nuances to learn. Day 2 and Day 3! One of my New Years goals is to be a bit more mindful of my health. Getting enough sleep is at the top of that list! Yesterday, I got smacked by that goal. I am a musician as well as an artist. Wednesday nights are our band rehearsals. I did not get a chance to post yesterday's drawing and it was too late by the time we got home from rehearsal. In the past, I would have stayed up, posted my post, and got to bed a bit late. Getting enough sleep more important than posting to my blog so today I have two posts in one. Here I go again! I am participating in another 31 day art challenge. This one is the Strada Easel challenge which requires 31 paintings or drawings all done from life. I like to participate in these challenges when I have more I would like to achieve than completing a daily drawing or painting for a month. I already know I can draw and paint everyday for a month as I have done it several times over the past few years. I like to up the ante with a personal challenge that pushes me to grow as an artist. 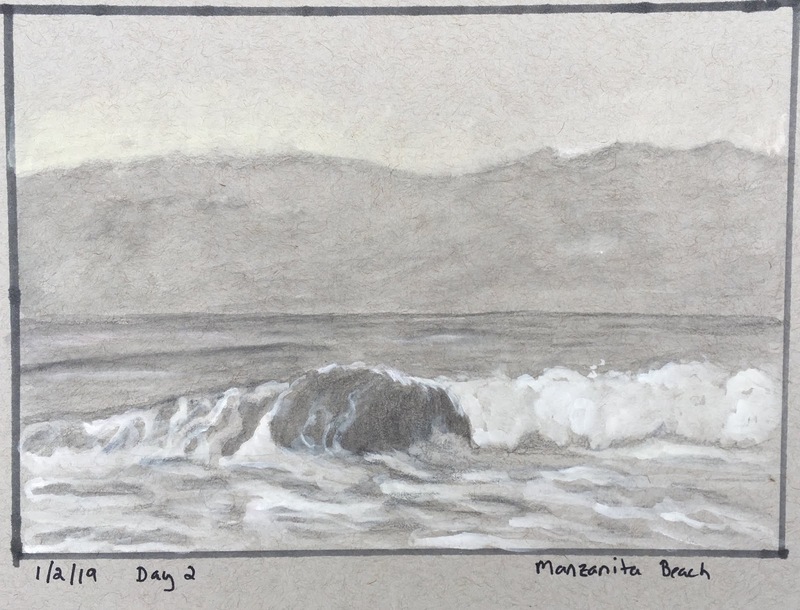 Because it is January and the weather can be challenging here on the Oregon coast, I decided to do a daily wave drawing. I can draw from the shelter of my car if need be. I will actually be combining drawing and painting. The drawings will be wave studies in water soluble graphite and white gouache on Strathmore toned gray mixed media paper. The mixed media is heavy enough to take the water without buckling. I have painted hundreds of wave studies over the years and I still have so much to learn. 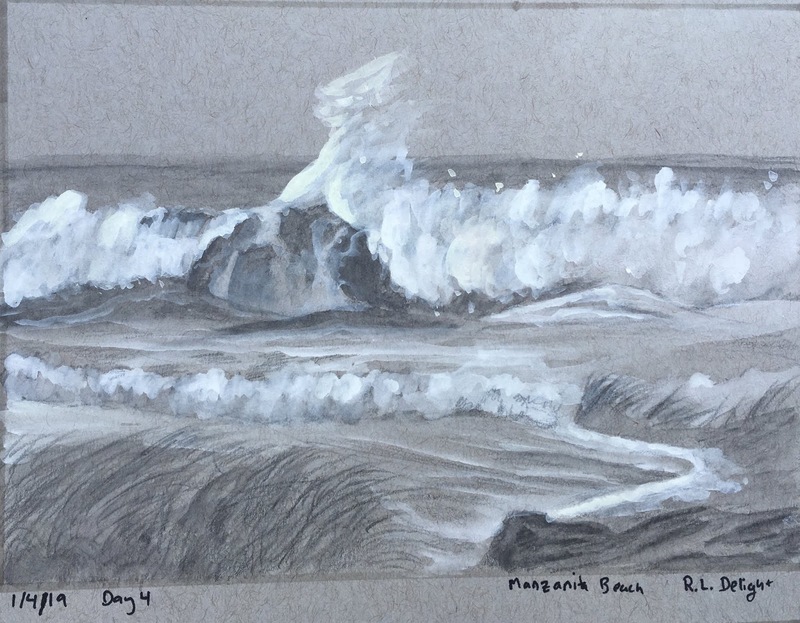 I am keeping the drawings more or less shades of gray which allows me to focus on value, composition, and hone my wave drawing skills. I still have so much to work on! I also will be taking color notes while I am out drawing. I intend to bring all this information back to the studio and translate them into small paintings. I may continue on with larger paintings from those. My ultimate intention is to start interpreting my own vision through the waves. I am not exactly sure where this will take me but I know it is all good! My animal drawing, anatomy studies, and paintings will continue. I spent yesterday, New Year's Eve, at the Oregon Zoo visiting and sketching my favorite Cheetah sisters and the other animals that braved the cold temperatures. I have a lot of plans, goals, dreams, and hard work ahead of me for 2019. I hope everyone reading this also is digging into 2019 for your creative life and your good health. Here is to the creative journey and good health! The holiday season is always a busy one. It can be even more so when you are a musician married to another musician. My mate plays the trumpet in several bands and sits in on several more during the holiday season. Most evenings there are rehearsals and performances. This evening I went up north with my mate and did the grocery shopping while he performed at a rendition of the Messiah concert. I completely missed blogging last week for pretty much the same reason. I always seem to get caught off guard by the sudden arrival of the holiday concert season! So as not to miss two weeks in a row, I am doing a quick blog post tonight. I started a new painting using one of my Inktober sketches for reference and inspiration. I have been documenting the work in progress. It is 24"x18", oil on panel. I built the panel myself! Here are three pictures of the painting progress. I still have a few more sessions to go before I set it aside to see if it needs a bit more. Until next week, wishing for all to have a bit of beauty in your day. It has been a busy day and a busy week so I will be keeping this one short. I finally took a break from my anatomy studies and went out painting. I had a particular spot in mind, only, when I got there, the waves and weather were completely different than what I had pictured in my mind to paint! That is the way it works on the coast. I did remember this other spot from an earlier visit and it did not disappoint. The only problem is, it is by the side of a road. It is a back road, but still, I don't paint along roadsides. This view! I couldn't resist so, in spite of my discomfort, I went for it. I only had about an hour and half of decent light before the sun went down and the sky was cloudy. I got a lucky sunbreak and I got as much information as I could. I will work on this in my studio to finish it. 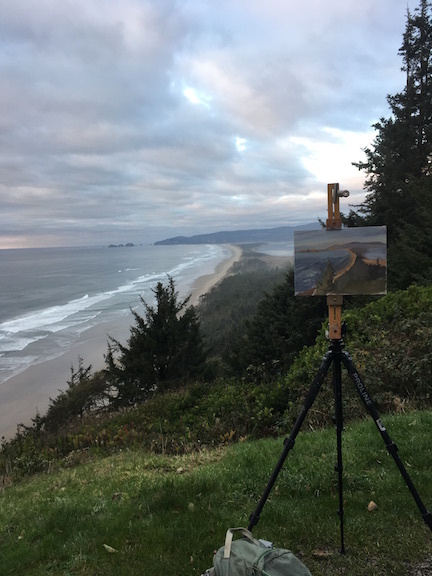 One thing I didn't take into account is that when people drive by and see an artist painting by the side of the road, they will suddenly pull over and take a look, and then they see the view! I had a crowd behind me as I worked as fast as I could to get the painting down. Usually, I am more sociable when I am out painting but I didn't engage much in conversation as I concentrated on getting this view on canvas. I am making progress on finding a printing service and am ready to order a few test prints of my drawings. I am still organizing and polishing up the small paintings to post for sale, very soon now. Today I finished the week with a life drawing session, bottling my hard cider, made from apples grown in the community garden, and set up my home grown sourdough to bake tomorrow. It is a good end for a long week. This week has been full of tragic news and my heart breaks for the families forever changed by the most recent shooting, and for those who are fleeing the fierce fires here in the west. It has become even more important to add beauty to the world. May everyone find a bit of beauty in the coming week. Inktober week is done and I drew 33 ink drawings in total! This is number 32. I originally drew it as a thank you to all those who followed my progress on social media. I am sharing it here as this is Polar Bear Week! So, what is next? I have participated in month-long daily challenges before and have always benefited from them in terms of my art. Usually, I just picked up where I left off and continued on. This challenge was different in many ways. First, I had never used ink as a drawing medium. Second, I have only just started drawing animals (not counting my teen years spent drawing animals from magazine photos). I struggled with drawing in ink for the entire month, however, even I could see the improvement in the handling of the medium day by day. While I am generally satisfied with my progress, I also recognize that I have a ways to go. 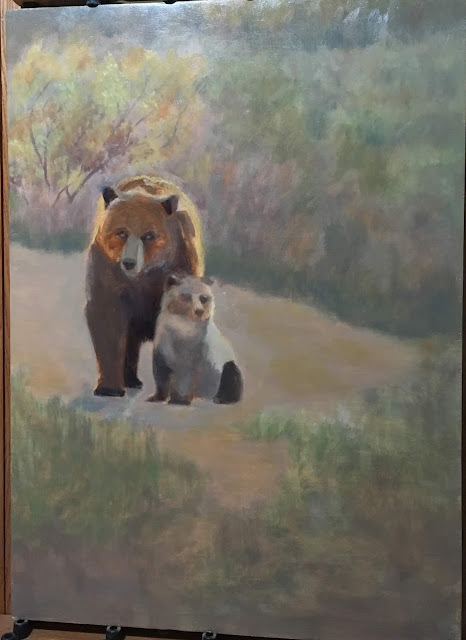 What I hadn't anticipated when I first set out to take on this challenge, was that I would fall so deeply in love with drawing animals and all that goes with it. 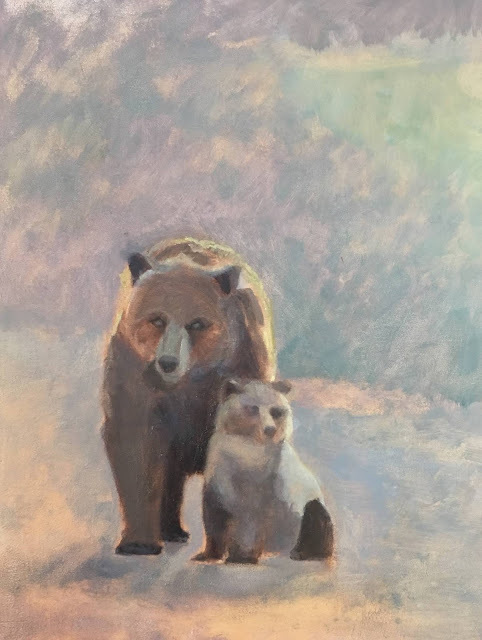 Taking on animal art, I had to break with my practice of not using photo reference and only drawing from life or imagination. I haven't used photo reference in my art because I just don't resonate with photos like I do with my subjects in real life. 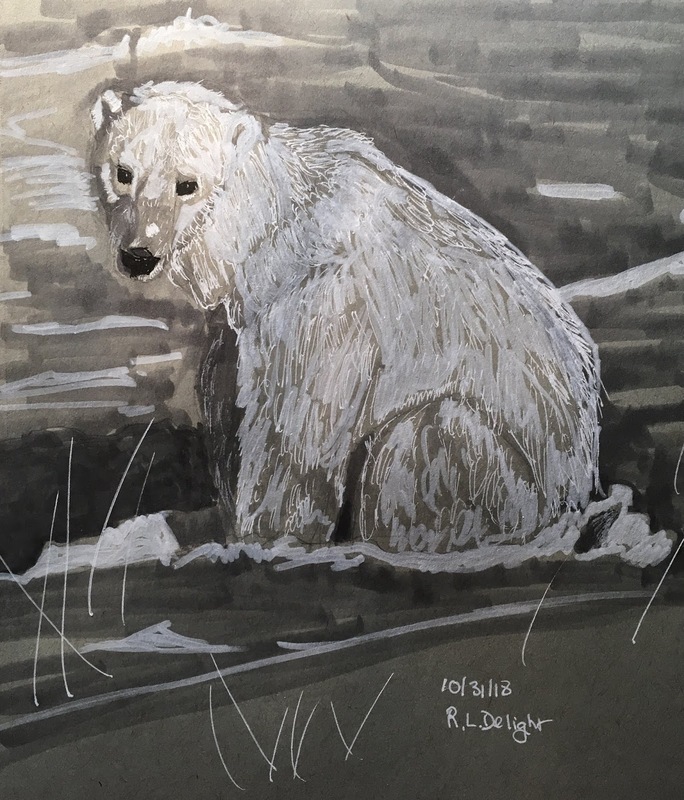 I have spent many days this summer sketching animals at the Oregon Zoo which is a one and a half to two hour drive, one way, over the coastal range from my house. With a few exceptions, I have used my own video footage, live webcams, and my sketches as reference for these drawings. A couple times I used my own photo reference. So, now it is time to go deeper. I had already begun to learn animal anatomy before I took on the Inktober challenge. Now I am going back and learning with purpose and determination. I need to have the ability to sketch and draw animals from life and imagination. That is going to take a bit time and a lot of work. Thank goodness we have so many resources these days with online classes and tutorials. Nothing beats working hard and drawing everyday as I continue to do. I am looking at printing services until I can afford my own quality printer and scanner. I will be selling prints and cards of the best sketches I did and of future finished drawings. I will also be posting small paintings for sale this week. I need to clean out my studio, so the paintings will be at sale prices from now until December 30th. A percentage of the proceeds from every sale will go to environmental and animal protection organizations. Some will be local and some will be national and international. Well, this is a long post but I wanted to share some of the growth and changes that have been happening in my studio. Thanks for reading this far! Go find the beauty in this week!